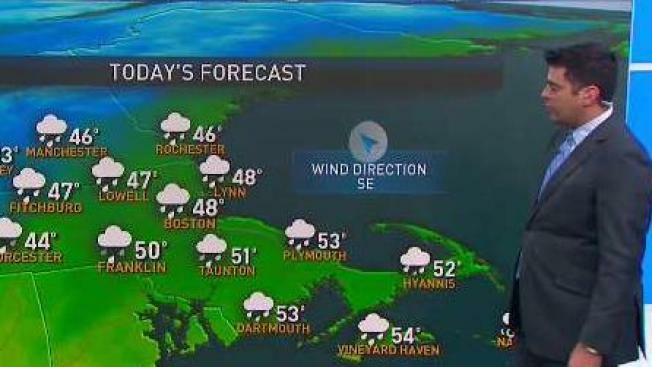 Areas of rain, breezy at the coast, snow in northern mountains. Highs near 50. Overnight Thursday: Partial clearing, lows in the 30s. Showers will be knocking on our doorstep early Thursday morning in western New England with the rain changing over to snow into the higher elevations of the Green Mountains in Vermont, and the White Mountains in northern New Hampshire. The line of showers will continue to spread from west to east over the course of the morning — sliding into central Massachusetts by mid-morning, and continuing eastward. As the line of showers continues to march across New England, by 5 p.m. Thursday, a low pressure is likely to form just to the west of the Cape Cod canal that could make for heavy downpours from Providence, Rhode Island to Boston, with some embedded thunder possible. Rainfall rates could be between a 0.5 inch to an inch at times. Wind gusts still pose a threat as gusts could exceed 40 mph, especially in southeast New England. On that note, be on the lookout for downed trees and possible power outages Thursday afternoon and evening. The low pressure then propels into the Gulf of Maine by Thursday night, drying things out for southern New England, but bringing rain to the southern coast of Maine and snow showers into northern Maine through Friday morning as the system slides out. We’ll see a break from the active weather temporarily for most of Friday, but it will be chilly and breezy with highs into the low to mid 40s under mostly sunny skies. The weekend starts off wet as another system slides in Saturday with rain south, wintry mix to snow north. Some lingering snow flurries possible in the mountains of New England early Sunday, otherwise the focus will be on the gusty northwesterly winds on the back-side of the system. Temperatures will slip over the course of the day. Then, it’s a relatively quiet start to Thanksgiving week, but we can’t rule out a slight chance for showers on Thanksgiving day. We’re keeping an eye on the busiest travel day of the year — the day before Thanksgiving — and on your holiday forecast as we get closer.